Saudi Arabia's Crown Prince Mohamed bin Salman has compared corruption in his country to cancer that needs shock therapy, according to an interview published in The Washington Post. "You have a body with a generalized cancer, the cancer of corruption. It needs chemo, the chemo shock, otherwise the cancer will destroy the whole body," said the Crown Prince, who is also Defense Minister. 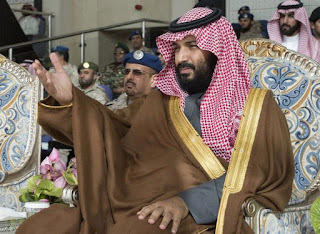 "If we do not stop this looting of corruption, the kingdom will not be able to reach its he Crown Prince is Saudi Arabia's new strong man, and has conducted a purge against hundreds of personalities, including ministers, in late 2017 in an anti-corruption operation. In a new measure, King Salman held on Monday a major shift ahead of the monarchy's army, dismissing the top military commanders, including the chief of staff. The goal is to get people new and energetic budgetary objectives," he added.